No matter the style of your property in Pembroke Pines, Concrete Vent Blocks can be personalized to add flair and contrast to any architectural design while also providing functionality and support. Concrete vent blocks produced by Atlantic Coast Precast will be functional and reliable when it comes to blocking heavy winds, rain, and debris from entering your space without inhibiting the flow of fresh air and natural light. Precast concrete is popular in Pembroke Pines for concrete vent blocks because it's durable, water tight, sustainable, attractive, maintenance free, and will not creep or shrink during or after construction. Since 1965, Atlantic Coast precast has worked closely with designers, architects, engineers, contractors, and other industry professionals to bring their ideas to life. Bring your samples, designs, and specifications to us and we can begin right away. In fact, call today for your FREE quote. In Pembroke Pines, concrete vent blocks can be functional or decorative, enhancing the look and feel of your building with a range of styles, colors, shapes, and sizes to choose from. 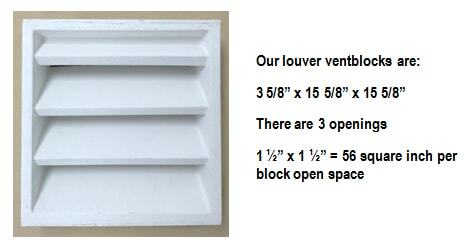 Our team can offer more information on our Pembroke Pines concrete vent blocks. They are a smart idea when you're interested in maintaining adequate circulation under your home or structure, allowing trapped moisture to exit and preventing mold.